The artificial grass market is growing at a rate of 6.8 percent per year. It’s not hard to see why. It’s less effort to maintain, doesn’t need water, and stays healthy all year round. 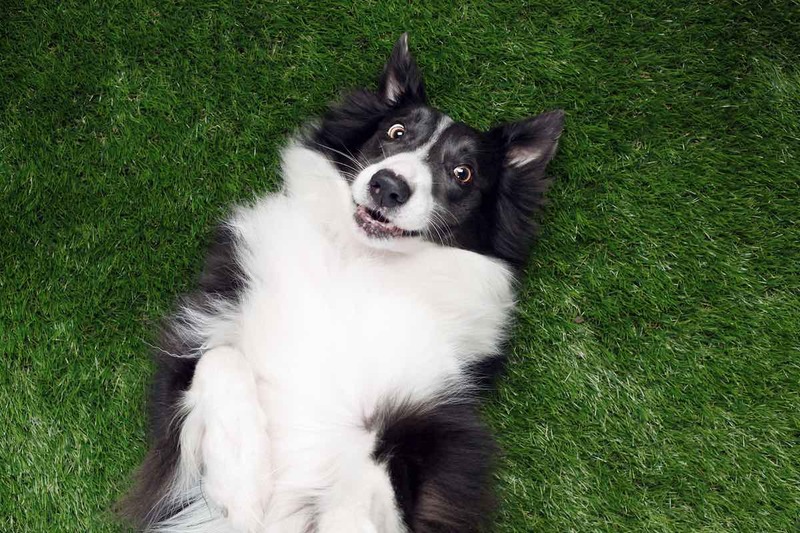 However, if you’re considering the switch to fake grass, you may have a few concerns regarding whether fake grass for dogs is safe? Fake grass is definitely safe for dogs and any other pets. Even if your dog cannot help but chew or lick the newly installed fake lawn, no harm will come to your pet. The artificial grass is not toxic. Besides, many natural grass lawns are treated with chemicals. You don’t have to worry about your dog getting sick because of the artificial lawn. But, that’s not all pet owners may be concerned about in relation to artificial turf and dogs. Even though artificial grass which has been made and inspected in the U.S. is absolutely safe for your pets, it’s important to avoid older artificial grass lawns which may be treated with lead. If consumed by your pet, this could be toxic. However, if you choose artificial grass which is lead safe and manufactured in the U.S., you can be confident that your dog is safe. If you’re about to invest in a new artificial lawn, then you’re going to want to know if your dog is going to tear it to shreds. Well, you can rest easy here. Fake grass is much tougher than traditional grass. If you’re tired of your dog burrowing in the yard, then you don’t need to be concerned with fake grass. And yet, your dogs and other pets will enjoy playing on the fake lawn. It’s comfortable and durable so you have the best of both worlds. If your dog usually poops on your natural lawn, then you’re probably going to want him/her to continue doing the same on your new fake grass. Your pooch may require a brief time to get used to the new environment. But after this, everything should be the same as before. Your canine friend’s waste won’t damage the fake lawn either. You can remove the waste and clean it easily. The permeable backing also allows fluids, such as your dog’s pee to drain. You can also purchase dog-friendly features to your artificial lawn, such as pet potties. However, this is not essential since the fake grass drains anyway. After your pet has done his/her business on your fake lawn, you can scoop it up and hose the grass. It’s also recommended to wipe down with soap afterward if you’re concerned about the odor. Now you know that you and your dog can enjoy the benefits of fake grass together. You can install your artificial lawn confident that fake grass for dogs is safe. At Synthetic Grass DFW, we install EasyTurf for hundreds of happy dog owners. Get in touch to get started.